Here are some of the songs and riffs that I’ve created ukulele tabs for so far. I’m always looking to add more to this section so if you have a request, or some tab that you’ve created yourself that you’d like to share then please get in touch. 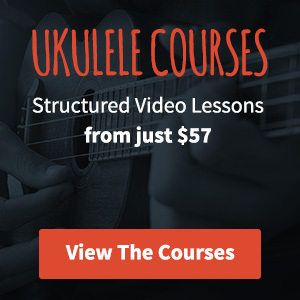 If you don’t yet know how to read tab, check out my guide on how to read ukulele tab right here. I don’t arrange an awful lot of songs myself but that’s something I’m looking to fix. I decided to get the ball rolling with my attempt at Bobby McFerrin’s 1988 classic, Don’t Worry Be Happy. Nana para Eva (translated as lullaby for Eva) is a beautiful solo ukulele arrangement from Choan Gálvez. Choan has very kindly allowed me to publish the tab here for you to learn. Hey everyone, Alissa is back with another brilliant tutorial (you might remember her from the brilliant lesson she did on Sam Smith’s Too Good At Goodbyes earlier in the year). This time she’s taken her skills to the beautiful Let Her Go by Passenger. Etude Op No. 2 is a relatively simple classical piece composed by Spanish classical guitarist/composer Fernando Sor. It translates rather beautifully to ukulele and is quite fun to play. If I’m honest, I had absolutely no idea who Ariana Grande was (I thought it was something you bought at Starbucks) so this is a bit of an unusual one for me to put on the site but what the heck?